iiiiiiiit's OCTOBER! I am so. dang. excited for this month. Not only because it means gobs of candy, cooler weather, and my kitchen renovation that I've been waiting 1.5 years for, but mostly because it's #STOCKTOBER! What they hey-ho is #Stocktober, do you ask? In case you missed it, September was dubbed “#Shelftember“…forever known as the month where the world was first introduced to Shelf Cooking. Which, by the way, is basically taking the world by storm. No, really. We have 5,000 people who joined our Shelf Cooking community Facebook group in a matter of days, over 2,000 #Shelftember posts on social media from Freebs, and testimonials that would blow your mind! If you haven't jumped on the trend, you really need to! (Get all the details about Shelf Cooking and the #Shelftember Challenge HERE.) To summarize, all September long we lived off of only $25 per week in fresh groceries, and otherwise cooked using what we already have in our fridge, freezer, and pantry. All October long we are going to go back to our regular grocery budgets (which, if you remember is $100/person in your family per month, starting at $300…and then break that down per week, explained in the video below). BUT…the challenge is that each week, HALF of your grocery budget will go toward items that can be stored and used at a later date. If you have 4 people in your family, that's 4x$100 = $400 per month for groceries, or more importantly, $100 per week (since we divide your budget by 4 weeks in the month). So with that $100 per week, you divide it in half…so $50 goes toward groceries and/or consumables to use right away, and the other $50 can only be spent on items to store and use down the road. Nope. It's not. I promise it's not. It SOUNDS easy, but there's a lot of strategy that goes into buying bulk, storing, saving, and stocking up…on a tight budget. 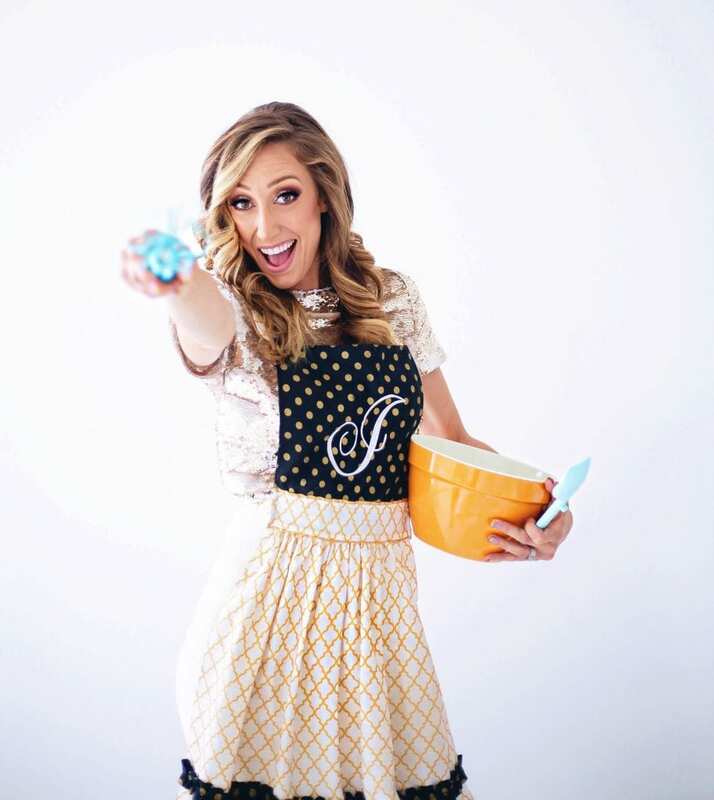 Have no fear, I'm a pro (I've been doing this my entire adult life if you couldn't tell by my freezer tour video) and am excited to share all my tips and secret sauce with you! 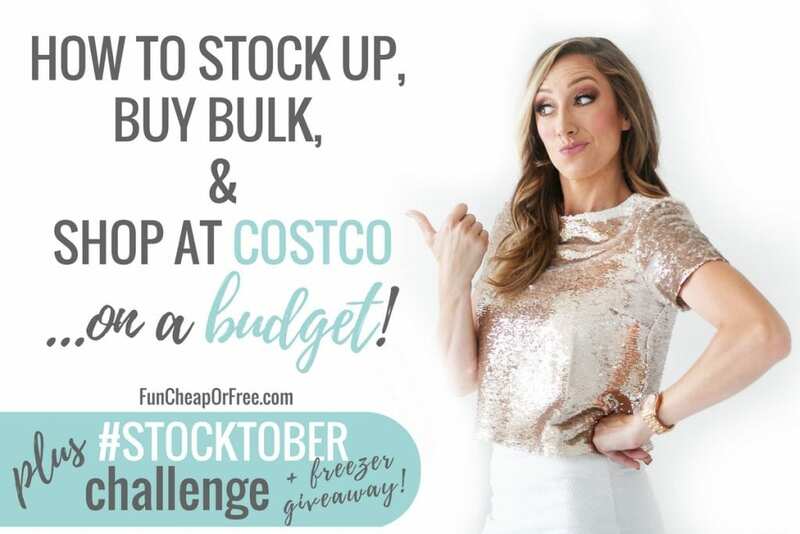 First things first, Bubba and I sat down for Q&A Tuesday and did a full video about #Stocktober, stocking up, buying bulk (aka shopping at Costco) on a budget, and much more. 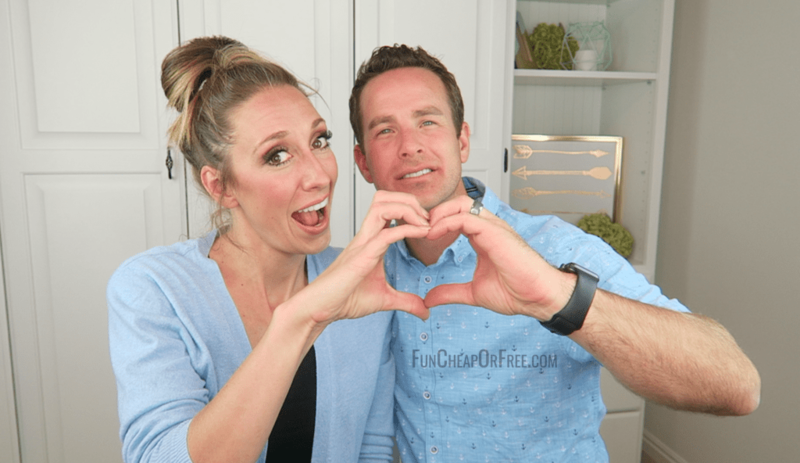 Check it out first, then come back for more links, tips, and info about the FREEZER I'm giving away! So what do you think, are you in?? It's going to be amazing! Not only will you have PLENTY of money each week for groceries and consumables to use right away, but by the end of the month you will have a gorgeous stockpile of food and consumables to swing you in the future when it's either 1) not in your budget, 2) you don't have time to run to the store, or 3) it's not on sale and you don't want to waste money paying full-price for something! Not to mention bonus >>>> 4) it will help protect and supply your family with necessities when a natural disaster or hard life circumstance hits. Grocery budget system – My super duper simple (grocery) budgeting system has gone viral half a dozen times for a reason. It's works! And it's really THAT EASY. Perfect way to track your grocery budget so check it out HERE. Divide and conquer – as mentioned in the video, you need to divide up spending responsibilities! See how to do this HERE. Zaycon – this is my new obsession for buying bulk meat. They did NOT ask me to say this, this is 100% my find, my opinion. Their prices are amazing and it's a great way to get quality meat, affordably, in bulk. Again, see how this looks in my freezers here. All things Costco! As mentioned in the video, I'm a bit of a Costco expert around these parts. Get all my best tips and trips on my Costco page. Now, let's win a freezer! I'm giving away another freezer this month, just like I did for #Shelftember. All you need to do is post about your #Stocktober experiences, finds, and participation on social media using the hashtag “#Stocktober” and be sure to TAG ME or else I won't see the post. I'll pick someone at random to win a freezer and will ship it directly to your house! I've decided to give away ANOTHER September freezer! Yes ma'am (…or sir?) you read that right! I'm buying it off of Amazon so it can be mailed directly to your house. It's a great size to put in your garage, guest room, fruit room, even on your back porch as mentioned in the video above! Entering is super easy. Just click this link or use the widget below. Giveaway will end Thursday at 11:59pm MDT so don't delay! Good luck, and can't wait to do Stocktober with y'all! What do you say…are you in?? Thank you for all you do! This exercise has been very eye opening! #funcheaporfree , Hubby and I are retired and living frugally. We grow a huge garden and can and freeze a good bit. We started buying our meat, with coupons, from Zaycon this year and buy from Amazon’s Subscribe and Save. I bake bread and make noodles, pretty much everything here is made from scratch. It just tastes better and we have the time to make it happen. Our grocery budget works out to about $40.00 a week, for everything! Thank you for the challenge of #shelftember. That gave us the kick in the pants to creatively use the more “vintage” inhabitants of our chest freezer and canning pantry! I will be stocking up on flour, sugar, butter and cheese. Happy #stocktober ! Hi Jordan. You are my bff and financial hero! I did #shelftember and loved it!! I’m struggling a bit with stocktober. Since we have a family of 6 that’s $150/wk for groceries. But with 2 teenage daughters who ran out of EVERY THING during September, $50 of my shopping money this week went to them! (Shampoo, feminine products, etc) that does not leave much for either the weekly groceries or stocking up. Do you still suggest the same formulas for families with teens (especially teen boys) who eat and consume more than small kids? I love all of your advice and so enjoy your videos!! Slow and steady! It won’t all be done in one month. As teenagers maybe they can help make money and pay for some of their own goods. I know I did as a teenager. And yes, I suggest the same formulas! My aunts and some close friends who have teens all lived by the same budget. Totally doable! Just make large meals with inexpensive fillers like potatoes, rice, veggies, and smaller amounts of proteins. Growing up in the South a common practice, esp with teen boys that always bring their friends over, is the ever constant pot of beans on the back burner (or crock-pot). Friends are always welcome and encouraged but between meal “snacks” mean grab a salad bowl and fill it with beans. Sometimes there is rice or corn bread but usually it’s just beans. This also allows for tons of options for condiments to add… Tabasco, salsa, cumin, curry, red chili flakes or Parmesan chz (really good if you can get extra for free when splurging on a pizza). If you want to be really decadent you can add “a dollop of chz” from the freezer. Mix together any combo of sour cream, yogurt, queso blanca, cream chz or ricotta & fill 1/2 way up in ice cube trays. One “cube” per salad bowl. If you have some leftover beans (try to make a different type each week) freeze what’s left with “juice” and when you have 3 types of beans, make “cowboy beans/cowboy black eyed peas” & adjust as needed. This is great for potlucks & esp for NYE… Equivalent to one 16 oz can of 3 different type of beans, two cans of corn and 1 or 2 “jars” of salsa. The best salsa I’ve ever had is jalapenos (remove seeds), olive oil blended until smooth. Optional is to add cilantro. This also freezes well & makes a great bean “dollop” or pesto, but I add walnuts because pine nuts are out of my budget. We know a couple that has a spot for a dishwasher in their kitchen but don’t have a dishwasher so they have a small chest freezer on a low platform with wheels so they can easily pull it out from under the counter. This post has really encouraged me to use up what I have. I’ve had to get a little creative at times, but it has saved us so much money! I love this! So helpful for saving grocery money! Ooooo! I’m coming late to the party— but I need to do this! I know in the past I’ve been so so grateful that I’ve had easy stored things stocked up for a time that I didn’t get to grocery shopping, or forgot an ingredient, or whatever. I’m going to try this! 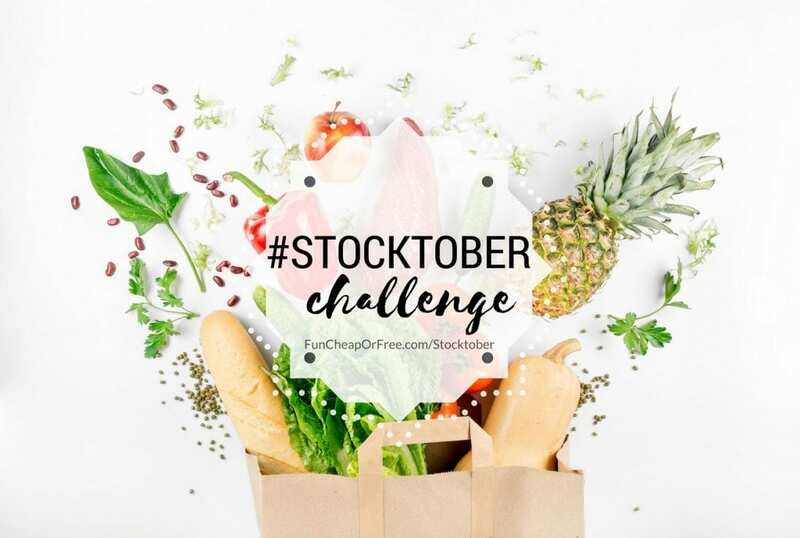 I loved stocktober so much if talking about food and saving money I always tell my friend about it!! I am so motivated to stick to $100 per person per month and love reading your ideas on how to stock up. Thank you! I love your advice on stocking up! I have a hard time knowing how to pay for stocking up and feel that I need to spend extra money on the extra things. Thanks for the advice, I will definitely be using it!! Love the Stocktober Challenge. Helped me save some grocery bills. Woohoo! This stocktober challenge has been a lifesaver for me. We rarely run out of everyday essentials and then it makes regular grocery shopping less stressful! I seriously love how you plan out your whole year food wise, like stocking up in September and not spending any in October to cycle out your pantry. Such a good system, I love it. What if you rent your home? Is it worth stocking up if you know you are going to move out of where you currently live in the foreseeable future? Since finding you on YouTube I have used the envelope system and paired it with using the Walmart grocery app to buy my groceries weekly. I don’t waste gas (my husband works beside the Walmart we use), I don’t add items to my list that we don’t need for the week, and in total I save tons! Thanks so much!! I loved Stocktober and Shelftember!! I hope you do it again this year, I’ll definitely do it along with you!! I hope you are doing this again this year! It sounded overwhelming to me the first time so I missed it but hope to if you do in October again! Stocktober was when I really started following you guys. My husband and I loved seeing your ideas and started planning meals around what we had in our pantry. I didn’t fully commit to do this the whole month since we had just moved and didn’t have a big freezer, but tried to do it every once in awhile. I actually learned quite a bit! I was able to find things I could use as substitutes in my pantry and freezer and I’ve been trying to stock my freezer a little better from what we use and need often! Just purchased my first zaycon order here in Florida! Excited to try it out! I stumbled upon you back last September in the midst of this idea! I’m super excited to actually attempt shelftember this year!! Ugh my kids distracted me and I didn’t finish! 😛 Shelftember and Stocktober! Planning on buying a deep freezer hopefully next month! I’m actually thinking of doing this again next month, in March! Loved doing shelf cooking and rolling into stocktober! While I’m still not perfect, I’m working every month on building our shelf food supply and freezer food supply!!!! 😊 thanks for all the tips! You and Bubba are awesome! We weren’t able to participate in Stocktber or shelftember when they happened (newly pregnant and had just moved into a new place… very little desire to try new things), but I definitely followed along and it’s convinced us to buy a freezer before baby comes so we can have extra food prepped and ready to feed us when baby arrives! Great idea!! I want to try this this year!! hope you do the challenge again!! I LOVED this stocktober challenge. I will say, though, I had to be pretty creative living in a small space! Love all the tips!!! Thank you. We’ve had Costco memebshio now for a couple years…havent felt like it’s been THAT beneficial..we mainly buy taco seasoning, tossed, and chickens, LOL we don’t have enough money I feel to make it worth it. :( I’ll be watching this to see how we can utilize the membership better. Seriously amazing advice! Thanks so much! It’s march so I’m a little late but we want to try shelf cooking in March. Well, mid March. You mentioned a Facebook page for shelf cooking but I can’t fins it anywhere. Can we get a link? Jordan, I can’t wait for #stocktober Thanksgiving , Friendsgiving, Christmas and We also have a huge New Years Party.. I stock up on Paper plates, the large foil pans. O freeze lots of butter.and so on.